Read all instructions and warnings before use! KEEP FROM CHILDREN UNDER 18. This device uses a high pressure disposable CO2 filled cylinder labeled for a Leland CO2 PicnicTap®. Do not use any other style cylinder. Care must always be taken when using high pressure equipment. Never point cylinder towards someone’s face. Stow cool. Do not heat over 140°F as rupture may occur! Discontinue use of this equipment if leakage or visible damage is evident. Never disassemble or modify. Do not allow water to enter regulator. Allow to thoroughly dry if water enters regulator unit. The CO2 filled cylinders are disposable and are not allowed to be refilled per US CFR 49. Punctured cylinders are considered to be empty. No residue remains in the cylinder after use. The steel used is a low carbon type which will turn to rust quickly if disposed in a landfill. If your community requires recycling then strip off the label and put with normal household recycling. Please recycle whenever possible. In the United States, anytime you ship a CO2 TapGas® cylinder by UPS ground, you must mark the outside of the carton with the mark as shown. If you plan to ship by air, you must tell the carrier what you are shipping. There are very different rules for air shipping, not just anyone can do it. If you need to ship a gas filled cylinder by air, please feel free to call us and we can assist you. As of the date of this publication, the FAA prohibits passengers from bringing any gas filled cylinder on an airplane. Although our gas cylinders are in every inflatable life jacket on board, you will have cylinders confiscated if you attempt to bring them. Plan ahead and make sure your cylinders are available for your beverage event. We can help you get them there too. Carbon Dioxide Gas is the entire contents of the Leland CO2 PicnicTap® cylinders. It is a non-flammable gas which is used in the beverage industry to carbonate beverages. Although it is not toxic, it will cause simple asphyxia if inhaled. We capture CO2 from many sources, a kind of pre-recycling. Respect must be given to any high pressure gas cylinder. Promptly dispose of all used gas cylinders. We will fax you our Material Safety Data Sheet for CO2 any time, just call on us to assist you. NOTE: Please refer to the PARTS DIAGRAM below. This will help your understanding of these operating instructions and warnings. Turn the REGULATOR KNOB counter clockwise to the off position. The word OFF must be aligned with the arrow mark on top of the REGULATOR GAUGE. IMPORTANT! The REGULATOR KNOB turns the CO2 gas ON and OFF. The pressure of the gas increases the more you turn the REGULATOR KNOB clockwise. Ensure that the LOCKDOWN HANDLE is unlocked and in the up position so that the COUPLER LATCH is above the RETAINER. The LOCKDOWN HANDLE is moved by pulling out and then either up or down. Releasing it will allow the LATCH to engage. the COUPLER and LOCKDOWN HANDLE. and pushing down, then release. The LATCH should clearly be below the RETAINER. If not, make sure the COUPLER is properly and completely engaged. WARNING! 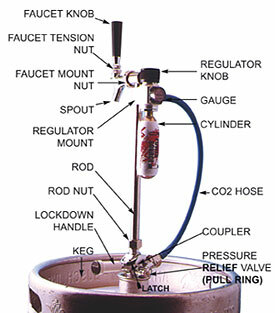 Failure to properly secure the TAP to the KEG may result in a sudden and unpredictable release of pressure energy. Do not attempt to use an improperly secured device or personal injury may result to you or persons nearby. Pull on the PRESSURE RELIEF VALVE RING for a couple seconds. If the KEG was shaken in transit or warmed, it may contain excessive pressure which must be relieved before trying to pour. A hissing noise is expected. Remove the BLUE PLUG from the REGULATOR INLET and retain it for cleaning later. Turn in a new Leland CO2 TapGas® cylinder clockwise firmly. This action punctures the cylinder and exposes the regulator to the high pressure CO2 gas. Put a glass or pitcher under the FAUCET SPOUT and pull the FAUCET KNOB forward. Beverage may begin to flow as foam for just a moment. Make sure the REGULATOR KNOB remains OFF. Usually, the beverage KEG has some initial pressure, enough to start a pour, albeit foam. Soon, the beverage will slow and then stop flowing. With the FAUCET KNOB pulled forward (on), slowly turn the REGULATOR KNOB on, clockwise, until the beverage starts to flow again. Do not continue adding pressure. Stop turning the REGULATOR KNOB when the pour begins. It doesn’t take much to “push” the beverage out of the KEG. Adding too much pressure will foam the beverage and add too much carbonation to it. So, just set it and forget it! When the beverage flow slows or stops, try turning the REGULATOR KNOB on slowly. If no beverage flow, then the CYLINDER needs to be replaced. CAUTION! Removing a punctured CYLINDER from the REGULATOR should be done slowly. Listen for gas escaping. This is expected when the seal is being broken. When gas is audible, pressure remains. 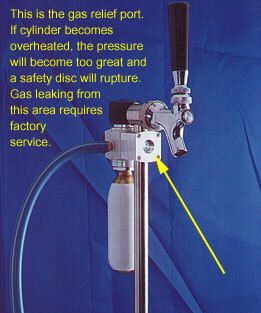 It is normal to expel some gas when removing the cylinder. by following 6 - 8 above. or our designated distributor using parts designated for a Leland CO2 PicnicTap®.